Failing to keep that balance can result in loss of minerals that results in reduced bone density associated with osteoporosis. A body which is too acidic has been linked to other conditions including athersclerosis, kidney and gallbladder stones and arthritis. Deep Green Alkalising is the solution. 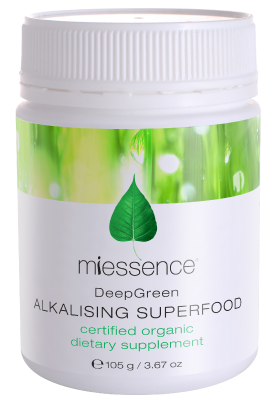 Made from the freeze dried juices from the world’s most potent sources of greens, Deep Green Alkalising is 100% raw, gluten free, vegan and certified organic. Keeping the balance Eating too many proteins and too few deep green leafy vegetables results in the overproduction of sulphuric, nitric and phosphoric acids, which are a natural result of protein metabolism. Taking one teaspoon of Deep Green Alkalising, with its rich natural sources of blue-green algae (organic spirulina), green grass juices and leafy green vegetables, helps restores the body’s natural balance. You can start children at any age on Miessence superfoods. Most of their customers tend to start them at the age of 2 years old. Start on just 1/4 of a teaspoon of each superfood and monitor it from there. You can always up the serving after a few weeks.